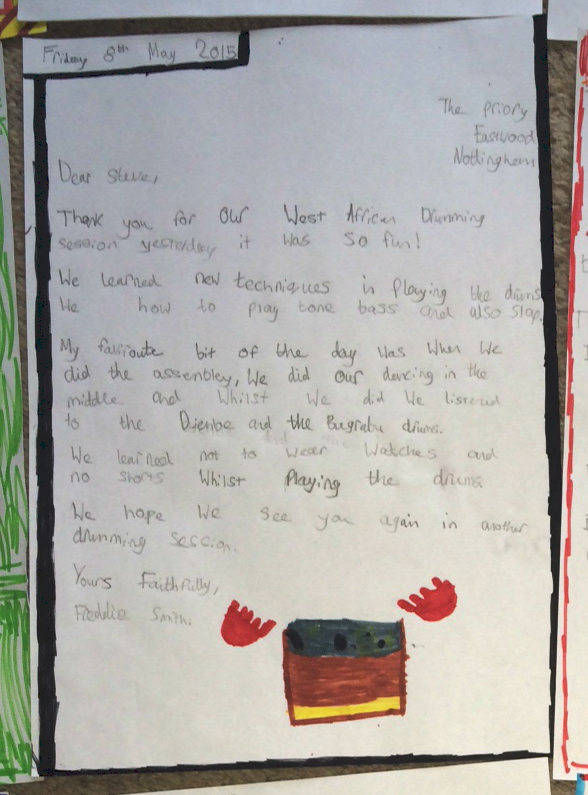 What school children learn from our African drumming workshops! 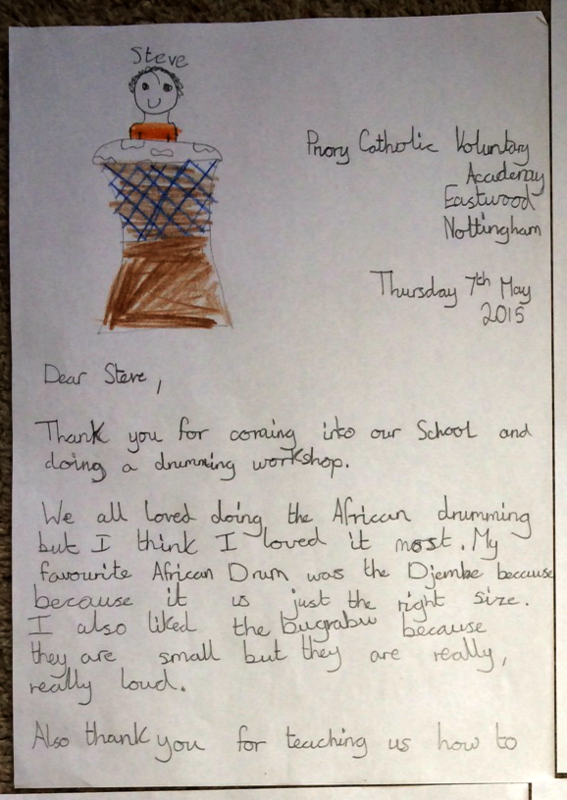 African drumming workshops for schools: what the kids think! This month we spent a full day with the Year 4 class at the Priory Catholic Voluntary Academy in Derbyshire. The bulk of the day involved teaching the children about our drums, how to use them safely, drumming techniques, then rehearsals for a performance. We ended with a performance for the rest of the school - and the pupils' parents - in the assembly. The whole day was excellently received, with many of the parents leaving us thankful comments on Facebook which we always love to read! The best part for us though has been receiving these handwritten letters from the children themselves. It's great to inspire kids and know that what you've taught them has sunk in! Thank you for our West African drumming session yesterday it was so fun! We learned new techniques in playing the drums. We how to play tone bass and also slap. My favourite bit of the day was when we did the assembly, we did our dancing in the middle and whilst we did we listened to the djembe and bugraba drums. We learned not to wear watches and no shorts whilst playing the drums. We hope we see you again in another drumming session." 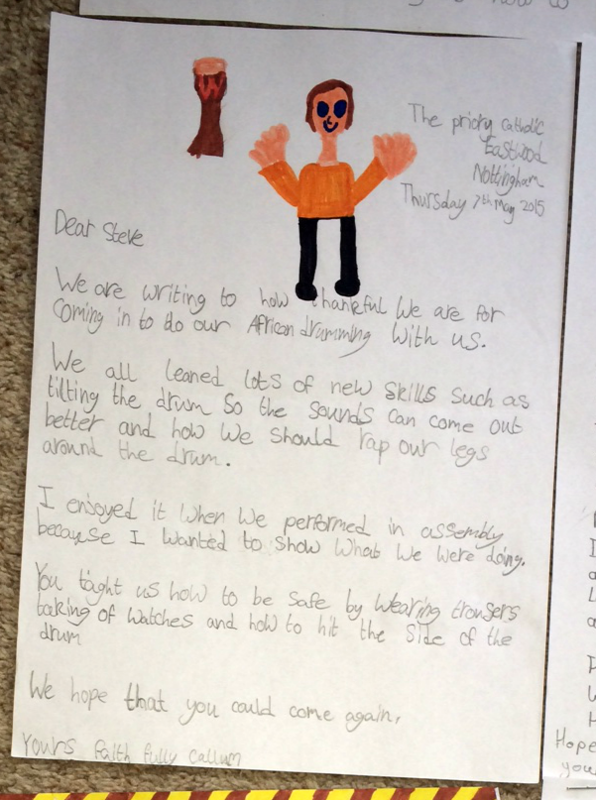 We are writing to say a big fat thank you for doing our West African drumming session yesterday, we hope you extraordinary like it much as us! We all enjoyed learning lots of new skills on the drums, for example: tilting the drum so the sound can come out when you play it, you showed us how to have the drum when it is tilted, we had to put our legs around around the drum. But the best bit of all was performing in assembly in front of all our parents and the school playing the bugrabu and djembe drums." "The whole class was thrilled how good you were, you amazed the whole class with your drumming and your skills. When you tilt the drum at the bottom, it works better and there is a bit of echo on it." Thank you for coming into our school and doing a drumming workshop. We all loved doing the African drumming but I think I loved it most. My favourite African drum was the djembe because it is just the right size. I also liked the bugrabu because they are small but they are really, really loud. Also thank you for teaching us how to stay safe whilst playing the drums. You told us that we have to tilt the drum otherwise the sound wont come out. Thanks for teaching me how to play the drums. I hope we do another drumming workshop soon." 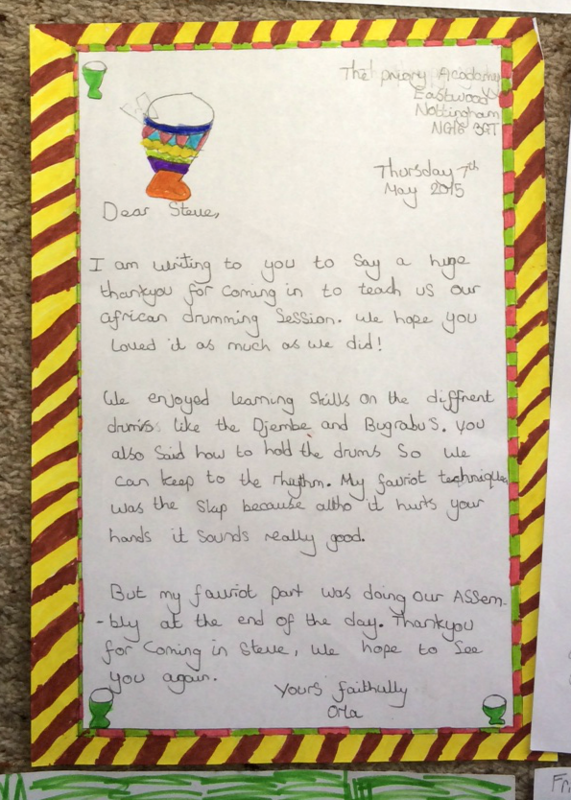 We are writing to say thank you for doing our West African drumming session yesterday. We had a wonderful time and I hope you did too! Firstly, I absolutely adored playing the different drums. I remember Bugrabu’s and most people play it in a certain place like as an example: Gambia and Guinea. Bugrabu’s are small drums. I also remember the djembe drums. Most people play it in a certain place like as an example: Mali, Senegal, Burkino Faso and Ivory Coast. Djembe drums are the medium drums also known as the larger drums! Secondly you taught us something that the drums on the top are made out of goat skin and cow skin."